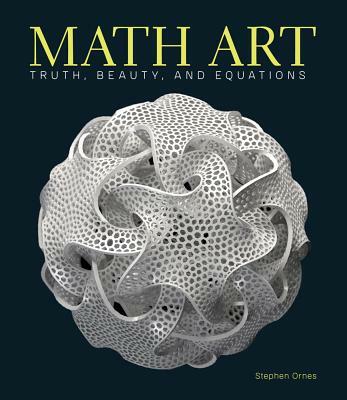 From geometry in motion to the possibilities of pi, this stunning volume reveals how art has been inspired by the beauty and poetry of mathematical principles. The worlds of visual art and mathematics come together in this spectacular volume by award-winning writer Stephen Ornes. He explores the growing sensation of math art, presenting more than 80 pieces, including a crocheted, colorful representation of non-Euclidian geometry that looks like sea coral and a 65-ton, 28-foot-tall bronze sculpture covered in a space-filling curve. For each work, we get the artist's story followed by accessible and thought-provoking explanations of the mathematical concept and equations behind the art. From 3D-printed objects that give real form to abstract mathematical theories, to mystic fractals, to Andy Warhol as a solution to the Traveling Salesman Problem, these artworks embody some of strangest, most beautiful relationships among numbers and across dimensions. Stephen Ornes is an award-winning science and math writer whose work has appeared in Scientific American, Discover, New Scientist, onEarth, Physics World, and other outlets. His story "The Whole Universe Catalog," about a quartet of aging mathematicians racing to save the largest proof in math history, was featured in the 2016 Best American Science and Nature Writing. His work has been recognized with awards from the AAAS/Kavli Foundation, the American Society of Journalists and Authors, Houston Methodist Hospital, and the Association of Health Care Journalists. He regularly contributes stories about science for children to Science News for Students, an online publication read by tens of thousands of students and teachers worldwide. He lives in Nashville, TN.